After the sunshine comes the rainbow! This week you can do ANYTHING you like on a card BUT you can only use one colour. I (Lythan) have been very strict with the team and quite frankly enjoy the power when they come begging to be allowed to use just a hint of one other colour. I did in the end allow black for the sentiment particularly if you do an all white card. But the real idea is to have fun with just one colour and see just what variation there is. Here's the design teams' cards to get you going, details of how they made their card will be on their individual blogs. We love seeing your creations and as always there are two ways to share them with us. Either leave a message with your blog link so we can come and see, or email us at www.daringcardmakers@hotmail.com, with your name and website if you have one. Remember we love to know how you put your card together. You inspire us in so many ways! All these baby cards are making us go aahhhh, though maybe the idea of more than one baby at a time makes you go aagggghhhh! We hope you're enjoying making the cards, baby cards are always nice to do - so don't stop now, keep them coming, we're loving seeing all your wonderful cards. Here we have some cards from the Design Team to set your imagination working, but we always love to see your work, so please don't forget to come and tell us you've made a card and where we can see it. Our contact info for this, plus all about this week's main dare is on the message below this one. Hi, from Keryn and it's my turn to set the Dare this week. Doesn't there seem to be more and more multiple births around at the moment. Or perhaps I'm just noticing as a member of my family is due to deliver twins in September this year. Your dare for this week is to create a card using any technique, any style, to welcome the birth of multiples. If you keep the card long enough there is bound to be someone you know having twins or more to send it to. Here's the design teams cards to get you going, details of how they made their card will be on their individual blogs. We love seeing your creations and as always there are two ways to share them with us. 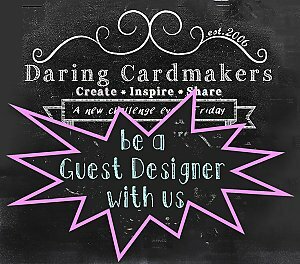 Either leave a message with your blog link so we can come and see, or email us at www.daringcardmakers@hotmail.com, with your name and website if you have one. Remember to let us know how you put your card together. We're having such fun checking out all your "How Random" cards - it's proving a popular, if frustrating Dare and there's still plenty of time to challenge yourself with this one - or even have another go....... if you're brave enough! Go on, give it a go!, you'll have fun. Yes, really! We have a Themed Little Extra this week. A little encouragement to make those cards you usually have to make in a hurry - see how we like to help you? So this time we'd like you to make "Get Well Soon" type cards. That's it - nothing too tricky or complicated this week, just a little nudge in the "Be Prepared" direction. This week the fantastic Kel has set a brilliant dare that is a real challenge. Firstly make a list of 10-20 crafty items you have in your stash, whether it be brads, ribbons, peel-off's, craft robo, dies, stamps, glittter, buttons, flowers, patterned papers, paint... You get the idea! Give them all a number or print them out a sheet and pop them in a hat all folded up. Next, ask someone non-crafty to either pick 3-5 of your numbers or pieces of paper from your from your hat. Finally, make a card using ONLY the items chosen. A card blank, some sort of sticky stuff and your basic craft tools are allowed If you want to make it really challenging, list plenty of items that you haven't used in a while, or thought you may never use again! Here's the design teams cards to get you going, each Random list will be on their individual blogs. We love seeing your creations and as always there are two ways to share them with us. Either leave a message with you're blog link so we can come and see, or email us at www.daringcardmakers@hotmail.com, with your name and website if you have one. Remember to tell us what random things you had to use! Time for a Little Extra fun - and a reminder that we're still on the look-out for even more Superheroes for the collection - so if you haven't already captured your own particular superhero on a card, then there's still time. When you're done, come and let us know, then WHIZZ, BANG, KAPOW we'll be there to see what you've created! For this week's Little Extra challenge we've got a sketch, template, plan - call it what you will, and we hope you'll enjoy using this one as much as we have. Remember you can stretch, twist, shrink or even turn it upside down - just as long as we can see the template is there anything goes! As usual some of the Design team have had a go at this one - in fact, so many this time that there isn't room to show them all here, so please have a little look around the Team Members blogs to find more cards we've made using this sketch. We'd love to see what you do with this sketch, so leave us a message and we'll pop along to have a look. Enjoy! su·per·he·ro (sū'pər-hîr'ō) n., pl. -roes. A figure, especially in a comic strip or cartoon, endowed with superhuman powers and usually portrayed as fighting evil or crime. We have Lynne with us this week as a fabulous guest designer, Lynne and the DCM team have risen to the challenge magnificently and created these fantastic cards to show you - don't forget to check out all our personal blogs for all the low-down on what we used and how we used it. We love seeing all your artwork and as usual, there are 2 ways of sharing with us. Either add a comment with your blog link or email us at daringcardmakers@hotmail.co.uk and we will add your card to our Gallery. Can't wait to see what you create, have fun!! So, how are you faring with stepping out of your Comfort Zones? We've already seen some great cards made by those who bravely took that scary step - and are probably safely back in the crafting space where they feel most secure, but for those teetering on the edge.....come on, you can do it - it may be scary but we promise you can go back to your favourite things as soon as you've made just ONE card to show us! And now, a drum roll, please......We're absolutely delighted to announce that joining us on the team, as our very first DCM Guest Designer is Lynne, AKA Crafty Devil who has very kindly agreed to come on board for the next couple of weeks. Those of you who've been following the blog for a while will know all about her fantastic cards and other crafty projects she inspires us with on her blog, so it's going to be fab to have her on the team. We plan to work her really hard while she's with us, and she's straight in at the deep end with a card for this week's midweek mayhem. We have another of our recipes for your Little Extra challenge this week. 3 buttons, 3 different papers, and 3 different ribbons. As long as you have those items on your card you can raid you storecupboard and use anything else you want. We'd love to see what you come up with, so leave a message and we'll come and see your creations - and just to get you started here are some from us.